Imagine never running out of Cocktail Shaker Tins again with value 10 pack of them. When the bar gets busy it always seems that one of the most used items behind the bar are all in the sink. Grab this set of 10 - 30 ounce stainless steel tins and you'll be good to go. Also comes with a big 12 inch hardwood KegWorks Cocktail Muddler. Never run out of cocktail shakers when it's busy. 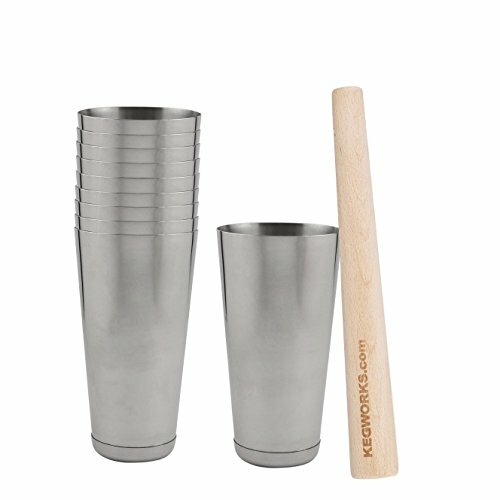 Comes with a KegWorks 12" hardwood cocktail muddler. If you have any questions about this product by KegWorks, contact us by completing and submitting the form below. If you are looking for a specif part number, please include it with your message.